This Tablecraft 341B-1 7" x 1 1/2" black plastic safety ashtray is excellent for any bar or outdoor patio that accommodates smoking customers. This ashtray is constructed with black phenolic plastic that makes it easy to clean and heat and break-resistant. Its sleek, black color enables it to blend with nearly any decor or theme. Also, the island design reduces the risk of leaving behind ugly burn marks on the bar or table top by allowing customers to deposit ash in a sanitary manner. The combination of the shallow well and tapered design allows you to securely stack the ashtrays while saving space during storage. If you are looking for an inexpensive ash try and you are not too concerned with the look, this is a good option. These are very reasonably priced and work well. They are not the best looking ashtray I have seen but they are very basic and cheap. Save money here, but know you are not buying the most amazing ashtray on the market. 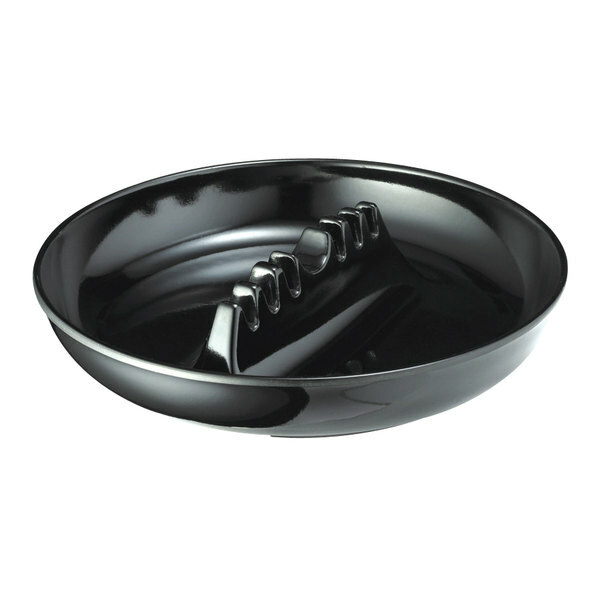 This table craft black safety plastic ashtray is a great deal! You can get one or a few for your home, restaurant anywhere! Get yours today! Well, what can we say. It is a traditional large black ashtray. We do enjoy its size, so we can put ashes and butts on separate sides. Pretty study product too. Single large ashtray with center piece to place or rest your cigarette. This was a very good price and delivered to my door with ease. The Tablecraft 341B-1 Black Plastic Safety Ashtray is amazing, I smoke a pipe and it holds the stem very well even in windy outdoor conditions. These are perfect for our pation; durable to handle being thrown around by rowdy guests and cheap enough to not worry about them getting frisbeed onto the roof. These are great! Not only are they super cheap but they ship fast too! They also clean up really well, with is a big plus! Keep unattractive butts off the ground! This very affordable ashtray is not only effective but it is safe to use!! Good for employee picnic areas! This is a useful product for the outdoor seating at the bar I work at. Before we had these I would have to clean ash off the tables every hour.